Skrillex has announced his first US festival performance since 2016 with a set scheduled for Minneapolis’s Snowta two-day event in December. After a quiet two years, the EDM producer has been making a gradual comeback in recent weeks. At the end of the July, for instance, he made his return to the festival stage at Fuji Rock, Japan. 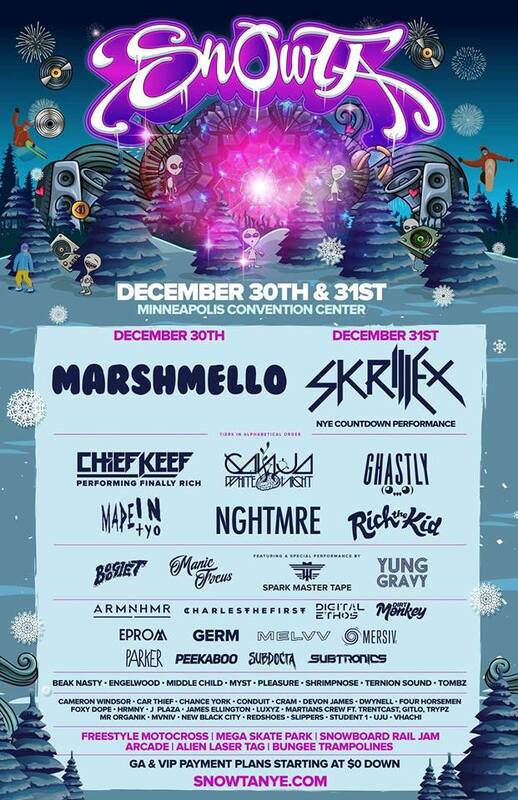 Now, Skrillex has been officially locked for Snowta, which takes place on December 30th and 31st in Minneapolis Convention Centre. You can see the full line-up so far below. Last week, Mura Masa enlisted the producer – real name Sonny Moore – on his new single, 'Complicated'. In a recent Instagram post, label mate Josh Pan also suggested that the OWSLA founder was about to "put out some crazy music”. Pan’s statement came just weeks after Los Angeles-based producer Yultron tweeted that Skrillex’s “new music is bout to change the game again”.